"The entire world was looking at Johannesburg so we had to do the right thing." The less said about the alien refugee film, District 9 and its racial allegory, the better. Your experience will be enhanced by the less you know. The film will blow you away with its audacious filmmaking style and special effects the way The Matrix did, ten years ago. Thus far, the marketing and press for South-African director Neill Blomkamp's feature film debut based on his acclaimed short film, "Alive in Joburg", has been very careful and clever as to only reveal the basic premise and hint onto the plot. Blomkamp blends some documentary-like imagery with stylish action and top notch special effects for a thrilling, highly original, and inventive film. This is a very personal, visceral film based on a first-hand account of Blomkamp's experience growing up in apartheid-era Johannesburg before moving to Canada to attend Vancouver Film School. Twenty-eight years ago, a ship full of one million alien refugees referred to as "prawns" show up above the skies of Johannesburg, South Africa in a massive spaceship. The prawns are malnourished, unhealthy, starved and without their leadership. Government officials herd the aliens into makeshift housing that resemble militarized slums, the titular District 9. After so many years, the human population gets fed up with the destructive presence of the prawns and the government turns over the care of the aliens to (the evil) Multi-National United (MNU), a private defense contractor, who are charged with moving the aliens to a safer, more secure location outside the city. A well-meaning but totally clueless company man, Wikus Van De Merwe (Sharlto Copley) is put in charge of the alien relocation Wikus goes through a very captivating character arc as his journey proves very satisfying and smartly conceived and acted. His character works well as he starts out as an unlikeable dweeb going through a very meaningful emotional journey. The film tries to be scathing satire on race relations and failure of communication while marrying heart-pounding action thrills and largely achieves these aims. With a lot of compelling character development and well-shot explosions and gun battles, we delve into this world of alien drama head on. District 9 delves into the possibilities humankind would explore if met by aliens we could take advantage of. 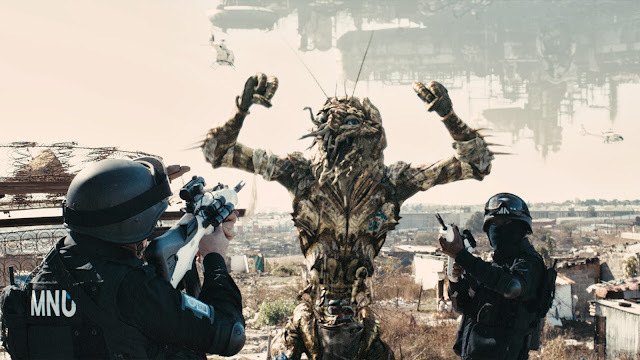 To set up the world of District 9, Blomkamp and co-writer Terri Tatchell (under the guise of producer Peter Jackson) explain exactly what they need to creatively and do without unneeded exposition. The film relies on the audience to fill in the plot mechanics on their own. It is easy to buy fully into this world Blomkamp and company have carefully crafted. District 9 uses documentary-style camerawork with interview cutaways and found footage to establish the world in the first act of the film and wisely abandons that for a more conventional action-filled chase narrative that feels like a series of video game cutaway scenes. However, the idea that is took the aliens over twenty years to do what is needed to set the story in motion along with what MNU does seems a little forced. Certain things are needed to fall into place to set the story in motion but is ultimately well executed. Halfway through, the movie turns into a sensational, non-stop albeit a little conventional action ride with a somewhat obvious evil corporation plot line. The documentary feel does a good job at making the world feel realistic and visceral. The fully-CGI prawns are seamlessly blended into the movie as the effects are awe-inspiring, but more importantly, believable and grounded. The detail put into the portrayal of the prawns is top notch and adds to the visual storytelling. The social commentary and allusions to racial segregation is ridiculously obvious and blatant but expected. The parallels to apartheid, gang warfare, slums, xenophobia, and terrorism sit on the surface. Blomkamp effectively uses shoot out and action troupes to form a compelling, sophisticated experience that is exciting and fresh. The beginning sets up an enthralling twenty year history for these aliens and a world much like our own. The care taken to shape the alien-occupied city of Johannesburg, South Africa is stellar and feels very authentic. This film almost feels like a smaller, cutaway film on what happens after humans defeat an alien race or sort of the logistics of dealing with contact with these aliens. It deals with a very specific issues about alienation and dispels with obvious clichés of alien invasion to deal with big issues of humanity. Although the basis of setting up District 9 is obvious and clunky, it works. The so-called eviction notices and interstellar legalities dealing with alien refugees in the face of the major prawn autocracies feels ludicrous and a clear way to service a plot point. What this story of alien segregation ultimately reveals is ideas about a loss of humanity within us. District 9 is bold, highly original, unpredictable, and wholly captivating in conception and construction. It is essentially one big, blatant, obvious allegory for apartheid and South African racial segregation with aliens instead of people and lots of well done action. Blomkamp throws you into this world with a reckless pace and thrilling action. This is a stunning visual achievement that seamlessly blends graphics and design on screen. "Don't give up on me, because I haven't given up on you." Using sci-fi action troupes it explores complex issues of humanity, torture, racism, and privatized military. The human message in this film is altogether familiar but paramount. It deals with a vital message of the treatment of all people with a measure of humanity. This should be celebrated as an achievement that sparks endless analysis and insight into this world and our own. Director Neill Blomkamp has crafted a dazzling adventure using all kinds of cinematic tools to entertain and alludes to meaningful ideas. District 9 is a sheer visual assault that intensely propels an intelligent narrative forward that speaks to the fallacies of mankind.